JESUS began His ministry proclaiming, “The Kingdom of Heaven is at hand.” In other words — it is now here! Everywhere He went, He preached it, taught it and demonstrated it by signs and wonders, healing the sick and setting the spiritual captives free. He brought heaven to earth and taught His disciples how to do it, too. 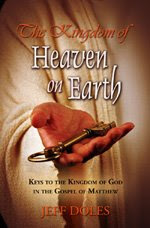 "The Kingdom of Heaven on Earth by Jeff Doles is an excellent and insightful presentation of the teachings of Jesus in Matthew concerning the Kingdom of Heaven. With his usual thorough and thoughtful style, Jeff shares the passionate heart of Jesus to bring the blessings of Heaven to the earth. This book is a tremendous guide for personal or group Bible study. I highly recommend it to anyone who wants to better understand the essence of the Christian life from the transformational teachings of Jesus, the King of Kings, who will rule over the Kingdom of Heaven on the Earth." — Ben R Peters, President of Open Heart Ministries.